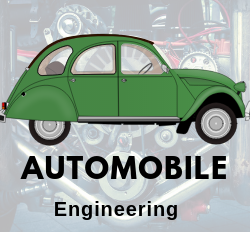 Automobile Engineering or Automotive Engineering is a highly specialized field of study of Vehicle Engineering. It includes applied design studies in collaboration with manufacturing and operation details of automobiles such as motorcycles, trucks, buses, etc., and their engineering sub-systems. Students of automobile engineering are trained in mechanical, electronic, electrical, safety and software engineering as part of their studies. With Europe housing some of the best automobile brands and plants, it offers some of the best places to study automobile engineering in a dynamic environment. Lot of companies are working on fuel Technology, hybrid cars and self driving cars. Opportunities are endless! You can work as design engineer, manufacturing engineer, Systems Engineer, QA Engineer etc. Vehicle Dynamics: This subject deals specifically with the understanding of vehicle's attributes such as steering, brake systems, handling, traction, and comfort. It trains students in designing chassis systems of the vehicle's structure, tires and wheels, suspension and the like to help them create a powerful vehicle of desired requirements. Fuel efficiency: Students are trained to understand and develop their skills in designing automobiles that are extremely fuel efficient and environment-friendly. Safety Engineering: Students are trained to assess the vehicle's resistance in various crash scenarios and the impact of such incidents on the vehicle's occupants. Acclamitization: Students are trained in designing climate controlled vehicles, which include cabin comfort, defrosting of the windshield, cooling, and heating comfort, etc. Drivability and ergonomics: This study includes understanding of a vehicle's roominess, engine compartment and component placement, driver's access to the steering wheel and comfort positions, ingress/egress, cold starts, RPM dips, performance levels, launch stumbles and hesitations and response to various driving conditions to name a few. This also includes the understanding of shift engagements, wherein the vehicle is influenced to act as per the powertrain. Noise, vibration and harshness (NVH): Students learn the various classifications of NVH such as road noise, component noise, wind noise, rattle, squeak, etc. Program timing, ease of assembly and cost: Students are trained in product development wherein even a complex vehicle can be designed in such a way that it can be assembled and dismantled with least to no damage to the vehicle. This is essential as it affects the production time of vehicles at plants and also the variable costs involved in the selling price. With 1-2 years of experience and a degree in Automotive Technology you can earn around 45,000 Euros/yr. There are three major areas you might be working on Design, Production and Research and Development. Major employers are Volkswagen, BMW, Daimler, Ford, Peugeot. How to write motivation letter?